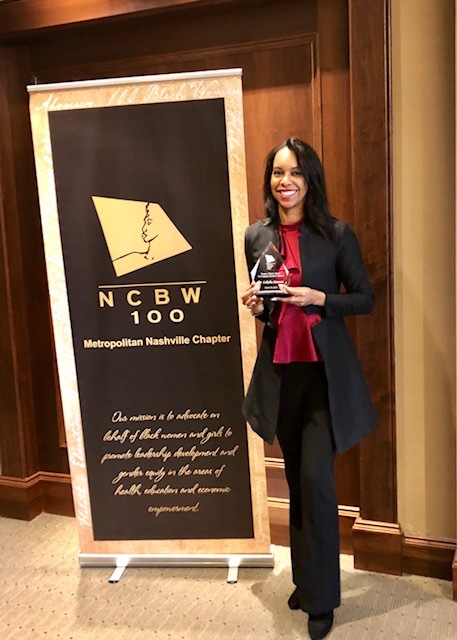 Associate Professor of Management Information Systems Dr. Lakisha Simmons has been awarded the Susan Short Jones Emerging Leaders Award by the National Coalition of 100 Black Women, Inc. Metropolitan Nashville Chapter. Jones was the founding president of the chapter and a lifelong community activist. The award was presented at the Women of Color Luncheon at Belmont, part of the Sister for Sister Conference hosted last weekend. Simmons participated on the Digital Divide panel at the event. She is the Speaker and EdTech Founder of Homework Suite Student Planner, an assignment tracker app for students.